Two unusual places in Brussels! Ric's River Boat and Ric's Art Boat , moored at Quai des Péniches/Akenkaai, 44 , 1000 Brussels, along the canal , opposite the listed building " Tour & Taxis " and very close to the Terrassess and the Tower of UP- site. "Ric’s River Boat" has a white /Red colour outside and an exotic outlook inside. It is suited for private celebrations, cocktail parties, weddings, anniversaries. Seated a hundred persons. Standing 170 persons. 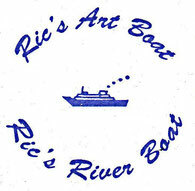 "Ric's Art Boat" has an White /Grey colour. There are two floors and it is more basic. Each floor holds about 100 persons. Suited for dances, concerts, exhibitions, sketches. Brussels Ric’s Boats are famous for the organization of a wide variety of parties: events of the European Community (various nationalities), parano evenings, 80-generation parties, electronic sessions, fetish events in co-production Brussels and Paris, Latino Noces (salsa and merengue), African jam sessions(reggae). Ric's Boats are also places where private parties for several recreational and cultural cores intersect in a varied program. “Ric’s Boats”, indeed, have grown into an "institution" in Brussels, as they have been active for more than 35 years (1973) in the Port of Brussels at the Beco Dock. Each floor holds about 100 persons. Ric's Boats are part of "Quality Nights" (an initiative of the Ministry of Health of the Brussels Capital).